ADA University students are more than future successful entrepreneurs and leading public figures. They are highly intellectual solution providers with ethics and sense of citizenship. One of the youngest universities in Azerbaijan claims this ambitious mission as its own. Founded in 2006 as the Azerbaijan Diplomatic Academy to offer trainings to diplomats and civil servants under the Ministry of Foreign Affairs, the educational institution has expanded with a tremendous pace, much to match the impressive growth rate of the country where it is located, and into a full University that offers undergraduate and graduate degrees across its four schools- Public and International Affairs, Business, Education, IT and Engineering - in English language. Although a small number for the corporation of students in Azerbaijan counting 160 000, more international students study today at ADA University that in any other university in the country. Students, faculty, staff and alumni from 46 nations call ADA University home and contribute to the tapestry of an inclusive learning environment here. Through curriculum built around a triad of rigorous major study, electives and general education, combined with experiential learning and exchange opportunities, the University trains high impact graduates in a truly international setting. Azerbaijan's total amount of public funding for the education system has amounted to almost 20 billion dollars over the past decade. ADA University has benefited from this support to build a world-class campus in one of the central quarters of Baku, the capital city. The first of its kind in the region, this "green" and "smart" campus houses intelligent facilities operated by renewable energy sources. Multi-media centers, interactive classrooms and spacious teaching and social areas have been complemented this academic year by the introduced MyADA information system that uses Banner program to meet student needs and expectations for an efficient and transparent data access. ADA University encourages its international students to engage with the local community through outings, language immersion, social projects and more to holistically address cultural, educational and civic growth. Its belief in studying abroad is interpreted also into an exchange opportunity with one of the 50 partner institutions around the world where students combine study and travel to broaden their horizons further. A campus trademark is a four-floor building of ADA Library. Both virtual and physical, it offers the most substantial English language collection in the country with an access to a half a million hard and soft copy resources in support of offered majors. Since 2009 ADA University offers International Fellowship named after Alimardan Topchubashov (hyperlinked) to bring first-class international education and leadership training to students across the globe. It has recently launched 2018 admission season for 700 open seats in all programs. With the application deadline of April 5, 2018 Topchubashov Fellowship is looking for candidates who have a strong commitment to serve a public cause. 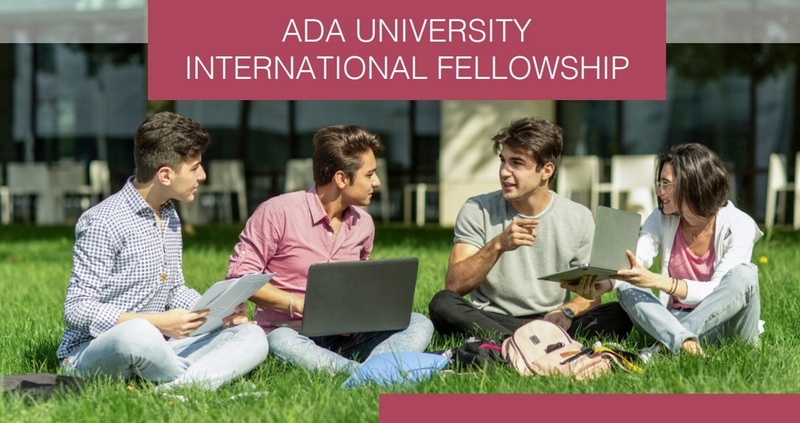 The Fellowship is open to all international undergraduate and graduate applicants who have been admitted to one of ADA University's degree-granting schools. The Fellowship is renewable every semester for the duration of studies when certain GPA criteria is met and covers tuition only. Recipients are expected to cover all other expenses, including housing, books, student fees and utilities.